I know those of you who follow me on Twitter or read my blog have been wondering where I have been the past few months. I have been a very active, vocal, and frequent contributor to the gluten-free/celiac blogosphere for the past four years but, a few months ago, something changed. I started CC Gluten Freed as a way to take ownership of my diagnosis and turn something negative into something positive, productive and enjoyable. I used blogging as a way to make eating gluten-free feel like more of a choice instead of as a burden. Blogging made things like explaining celiac disease to new people, attempting to cook gluten-free versions of recipes, and trying new strategies for dining out something I was “doing for my blog” instead of something nerve-racking and uncomfortable that I had to do for my diagnosis. In addition, my blog opened a lot of doors for me professionally and academically. I was able to turn my diagnosis into something productive that helped me grow professionally through my writing and advocacy work. I have attended conferences as a speaker, had my own table at gluten-free events across the country, been published in several magazines, gotten over 20,000 views on my celiac awareness Youtube video called “That Girl,” and offered internships and volunteer positions from many organizations all based on my work with this website. Most importantly, my social media work related to celiac disease played a large part in my applications to medical school. Given all of these positives, why did I take a hiatus from writing? In short, my blog had served its purpose. Writing helped me transition into the gluten-free world. It made me feel that asking for gluten-free food options everywhere I went made me an advocate, it made me special, and most importantly, it did NOT make me feel like a nuisance. Being an active person in the gluten-free community gave me confidence that helped me overcome the nervousness and embarrassment that sometimes goes along with trying to dine gluten-free. After four years of blogging, I felt like I had fully acclimatized to being gluten-free. I felt healthy and confident, all of my friends and family were on board and totally competent with gluten-free dining and living gluten-free seemed easier than ever before. The daily demands and constant vigilance associated with being gluten-free did not feel like a burden but, ironically, my blog was starting to. The blog had served as my shield but now, no longer in a battle adjusting to gluten-free eating, felt like unnecessary weight so…I stopped writing. For six months I felt great about my decision to step away from writing and I had fully embraced just living life gluten-free without making celiac disease such a huge part of every aspect of my life; then my environment changed and once again things felt new, uncomfortable, and nerve-racking and I realized that the sense of “normalcy” I had been experiencing was gone. First, I was reminded that celiac disease is a lifelong diagnosis and the gluten-free diet, despite what some magazines say, is not a fad but a lifestyle that is here to stay for millions of people. 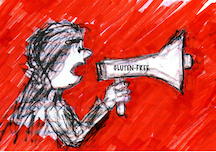 You can take a hiatus from writing but not from living gluten-free and being a part of the celiac community. The other lessons? I realized what a huge impact the work of gluten-free/celiac writers and advocates have on people trying to be gluten-free. For the past six months I have relied on the advocacy of others and was startled by what a difference all social media efforts make in terms of awareness. The most important take away point is that, your relationship with celiac disease and the gluten-free diet will likely evolve and change over time and that is ok. Let yourself change, embrace new attitudes, experiment with new ways of coping with and managing celiac disease. I am glad I took a break from blogging because that is what my relationship with my diagnosis was at the time and, now, I am happy to be back to writing and look forward to exploring how often and on what topics I will write as I continue with gluten-free living. At the very least, I have some fabulous Fall gluten-free recipes that I have to share with you all! Ultimately my point with this post is that you should allow yourself to evolve, adapt, and revert when needed to continue living a happy healthy gluten-free life. I want to end with a link to my first blog post that explains why I created this blog, where the name comes from, and why I became an advocate for people with celiac disease and living on a gluten-free diet.